School of Sport, Exercise and Nutrition lecturer Dr Claire Badenhorst nailed her first Ironman - winning her age group and scoring a place at the World Championship Ironman race in Hawaii in October. 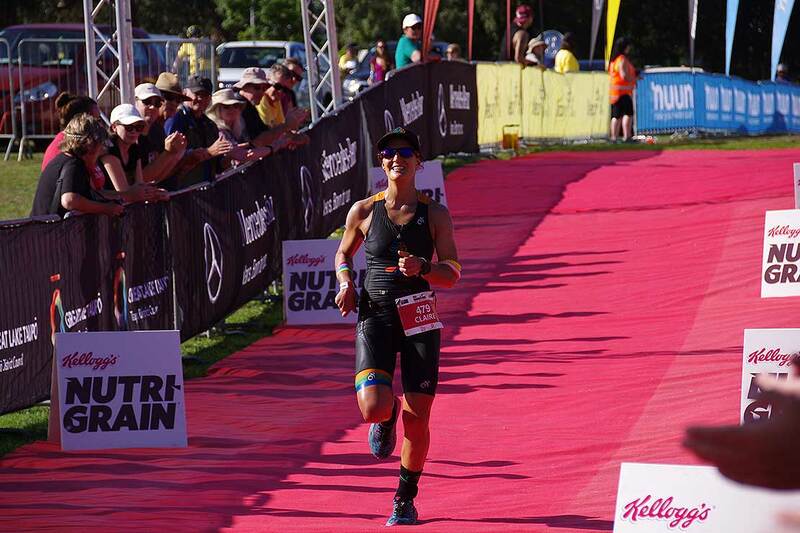 A year ago, Dr Claire Badenhorst set herself the goal of completing Ironman New Zealand. Earlier this month, she achieved her goal at a stunning pace, winning her age group (25-29) and crossing the finish line in 10 hours, 20 minutes. Triathlons are not something completely new to her. Around 10 years ago she started competing with the modest “sprint distance” (750 metre swim, 20 kilometre bike and five kilometre run) and gradually worked her way up to longer races. 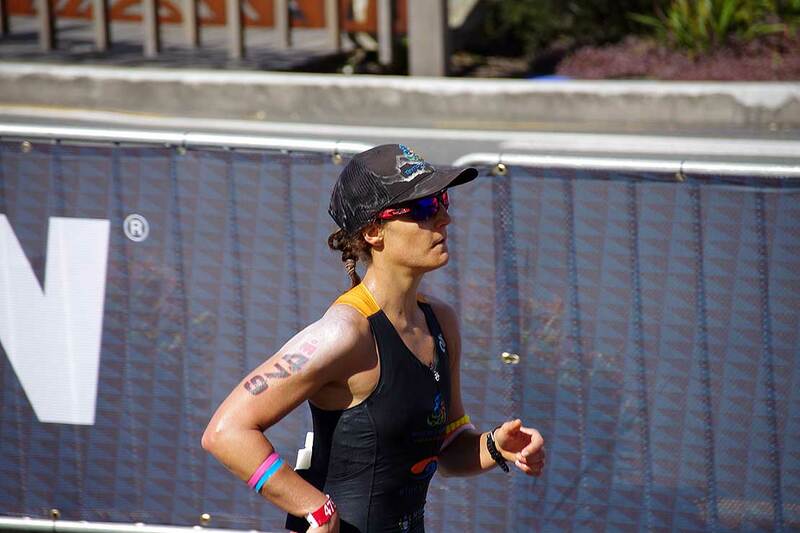 The Massey University lecturer in exercise and sport science says her involvement in triathlon and personal training is her full-time hobby. “My normal training load involves 18-23 hours a week split among the three disciplines. Broken down that is plenty of pre-five-am starts, then finishing the morning session before Auckland traffic gets too bad, the occasional office lunch time run, then home for an evening session before dinner and bed. Weekends are when I can increase the hours and tick off bigger training days, sometimes as much as five to eight hours worth of training in a day. While this may sound like madness to many people this is my ‘normal’ – a side effect of doing this sport for such a long period of time,” Dr Badenhorst says. On race morning athletes were treated to ideal weather conditions, which meant a flat lake for the swim, a modest temperature and when the winds did pick up, they would be pushing the athletes back from Reporoa towards Taupo on the second lap of the bike. “I have been targeting this race for a year and I knew I was in good form going into it, but I was aware that despite having a ‘plan A’ that I had worked out with my coach, I needed to acknowledge that for an event as long as Ironman you not only need a plan B but probably a plan C,D, E and F too. The best you can do in such events is focus on yourself and aim to control the controllables and hope for mechanical luck,” she says. Dr Badenhorst says she can not remember much about the marathon leg of the race. "I think I must have been so focused on what I was doing that I suddenly realised I had two kilometres left to run." After another swift transition it was time for marathon element of the race – the mammoth 42.2 kilometre run. “The run in a long distance triathlon is where you find out if you have gotten your nutrition and hydration correct. By this point you’ve been racing for more than six hours and the saying ‘it is 90 per cent mental and 10 per cent physical’ could not be more true. I knew a strong biker in my age group was ahead of me but I had a set pacing strategy and I knew I could run the distance well if I stuck to my race pace and plan. I was surprised when I passed her four kilometres into the run then as I was rounding out the first lap of the three-lap course a friend on the side-line told me I was holding down the lead position in the 25-29 age group. I had two laps to go and knew that if I focused on the training that got me here, I would be able to hold onto the position,” she says. “Ironman is incredible and the support you get from the side-lines from people you know and even those you don’t, can really carry you through those final stages of the marathon. In all honesty I cannot recall too much of the marathon – I think I must have been so focused on what I was doing that I suddenly realised I had two kilometres left to run." She says it was at this point, some advice her coach had given her came into her head. The win also gave Dr Badenhorst the chance to compete at the World Championship Ironman race in Kona Hawaii in October, as well as picking up the National Long Course New Zealand Championship.